For my Tech Trumps® Friday Focus this week I've chosen a digital technology that's ideally suited to the popular technique of "flipping the classroom", where students are encouraged to engage with content outside of the normal lesson, so that valuable time within the classroom can be spent in productive discussion and engagement. This week I'm talking about Edpuzzle. You can trim the video start and end, so you just get the important information you want students to focus on. You can add your own audio track, or add audio notes along the way, to help explain or challenge the students. 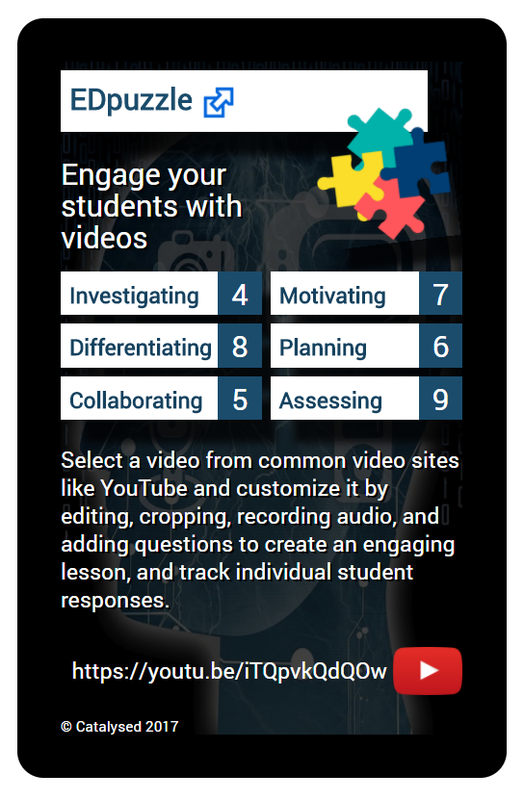 You can add quizzes, either open ended or multiple choice, to get students reflecting on the video. You can add comments, which can be useful to add what you expect from students or give additional instructions. As Edpuzzle supports classes you can then assign your finished video to a class, stop them skipping through it if you like, and set a due date. Once they start engaging with the video you can track their responses and how much time they've spent engaging with the content. Whilst Edpuzzle can be used quite successfully in the classroom, and that's certainly something I've done many times before, it's also ideal for flipping the classroom - i.e. setting your class content to engage with before your lesson, so that they can spend lesson time itself in richer discussion about that content. This has become a very popular technique in education, though perhaps a bit over hyped in some cases. If you're as old young as me then you probably remember being asked to read a specific text before the lesson next day so that it could be discussed in class (and the chill feeling down your spine when you're asked a question about that text, but didn't quite get round to doing the reading after all ...) but I don't seem to remember it being called flipped learning back then! Nevertheless, new technologies do now have something extra to add to that process, and one of them is, of course, Edpuzzle. 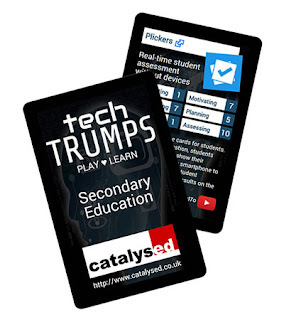 As you'll see from the Tech Trumps® card above Edpuzzle is particularly strong on Motivating, Differentiating and Assessing, so let's take each of those in turn and explore what that means in practice. Video is often described as a useful way of Motivating students, but that said one of the key things I remember clearly from my own teacher training was that when you use video in the classroom you need to be very clear what you're expecting from your students ahead of time. There's no point simply sticking them in front of a video and expecting them to learn - they need to be given context and challenge in order to actively think about the content they're consuming, and be prepared to respond to questions about it. And that's precisely what Edpuzzle will do for you. By embedding challenge all the way through, and using comments to clarify what you expect from students, you'll not only motivate your students with your video but also challenge them to learn. And then there's Assessing. Your students need to sign up for Edpuzzle, and of course that means you can track their interactions with your videos. Whilst from a very basic perspective this can help you ensure that they are bothering to engage with the task you've set, from a more useful perspective it can also help you assess whether or not they're understanding what you've set them, and hence adapt your teaching - either adding extra support or challenge as appropriate. Assessment for Learning, as opposed to Assessment of Learning. Finally, there's Differentiating. 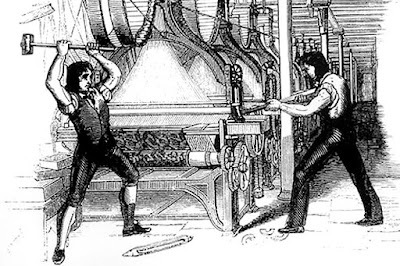 The argument with digital technologies and differentiation is that digital technologies have the capacity to be protean, to be malleable, to support variation in engagement. 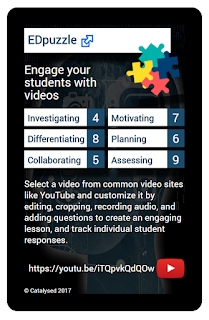 This can be a useful affordance if you're exploring differentiation by product or process; by having different expectations for your students you can then match the engagement you see through your videos with those expectations. Whether it's process, i.e. how much you expect individual students to engage with your content overall, or product, i.e. the level at which you expect individual students to respond to your questions within your video, Edpuzzle has you covered. You can also easily create differentiation by content as well, using the same base video but adding different levels of challenge according to different students - but that is a bit more time consuming - whether it's necessary for your context is up to you. So that's about it for Edpuzzle - a very targeted tech, and one which does require you to have permission to use, and access to, video; but a tech that can be a great addition to your digital portfolio, especially for "flipping the classroom". Do you have any ideas for using Edpuzzle that you'd like to share? Please feel free to add them in the comments!